It seems like just yesterday that we left the NICU at Akron Children’s Hospital. I have very many mixed memories of that place. Some of the scariest times of my life happened behind those walls and some of the happiest. In the midst of a dark time we did our best to make the NICU home. Years ago I bought an art print that says, “Home is wherever I’m with you.” (Yes, it was bought from Urban Outfitters and Edward Sharpe and the Magnetic Zeros were popular…ok now listening to them on repeat). Since our marriage, Dustin and I have moved six times. It’s funny to add “NICU” to that list. We spent most nights there but spent 17 at Ronald McDonald House and once a week at home to rest up. 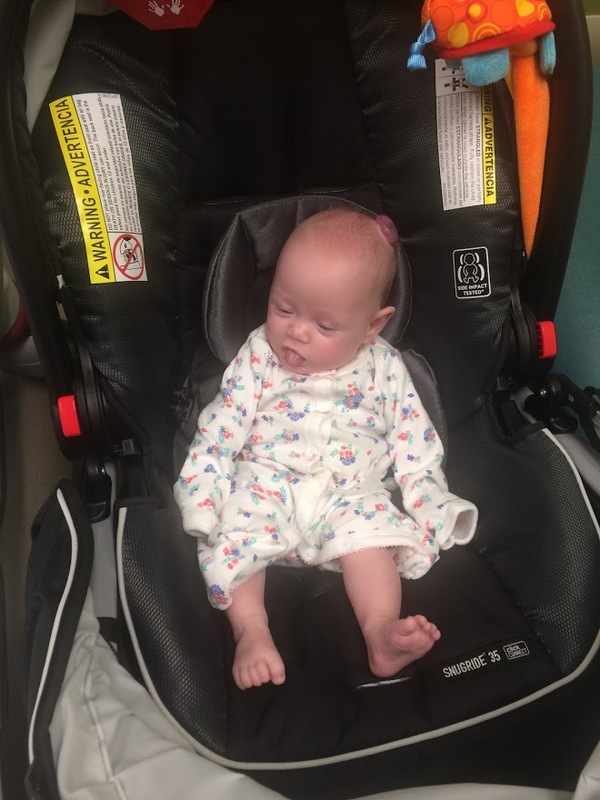 I plan on writing a lot more about making the NICU home and our experiences there. In the meantime, enjoy this video I took near the end of our stay. You can tell Bella is much more stable and is even in an open cot! Isabella in the ER with her tube replacement kit. Thankfully, we were not in the ER today. But, we spent time there twice within the last two weeks, one week apart exactly. Why? You ask? Because Isabellas Gtube keeps falling out! For me, blogging has been very therapeutic and helps me get my thoughts organized. Having a daughter with numerous health issues is overwhelming. One of the things I found when we lived in the NICU is that there are lots of resources about preemies but not many about G tube’s. So, I decided to begin blogging about her G-tube journey so that other moms might find it useful. This is also a great way to keep family and friends updated. 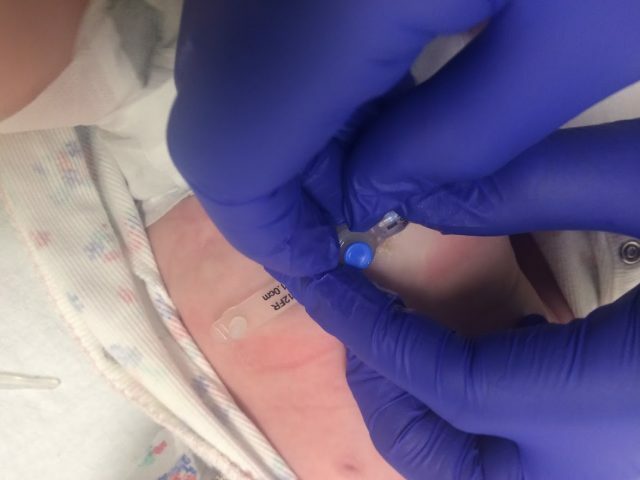 Bella has a G-tube and we were trained on it in the NICU. I felt pretty confident about things except for replacing the button at home. I knew it would just take some getting used to. 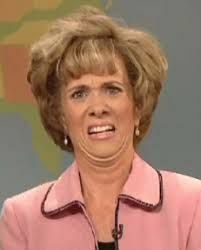 But I’m quite squeamish and looking into a hole in your baby’s stomach can certainly freak you out. We’ve become quite comfortable with this little button. We do hook up to feeds eight times a day. So, when her feeding tube did fall out we were prepared. It was during her for 4:30pm feed. I noticed Isabellas button looked loose. We were going to vent her which basically means let air out of her belly. She was crying and the button was being pushed out. This is pretty normal so I didn’t think much of it. When she cries the pressure in her stomach can push the button out. It’s not really something to be scared about. I mentioned it to Dustin who was with me. He didn’t think it was anything to worry about and continued hooking her extension to the button. I thought maybe I was being overdramatic and looked away for a second while he hooked her up. Before I knew it I heard him yelp and I looked down and the extension was attached to the button and the button was completely out of her stomach. I looked down and saw the hole and immediately remembered what to do. Dustin ran and grabbed the emergency kit while I held pressure on the stoma (medical term for hole). Luckily Isabella hadn’t eaten for awhile so the stomach contents weren’t pouring out. She was unhappy but didn’t seem to be in pain. There was a little blood from her granulation tissue but nothing crazy. Bella sleeps on the way up to Akron. You can see the catheter hanging out on her side. Dustin came in with the emergency kit in his hand. We prepare emergency kits with catheters in them in case the button falls out. It is a short-term fix to keep the hole open until we get to a surgeon who will replace it in the emergency department. 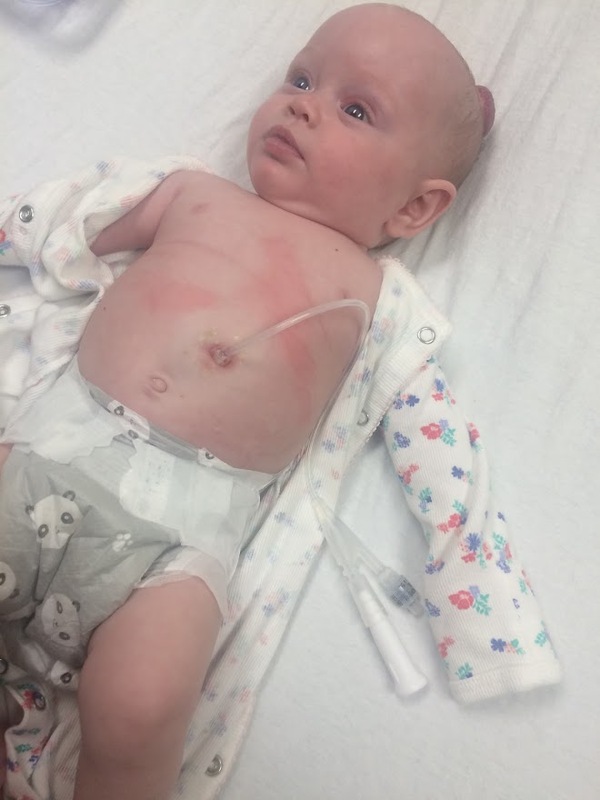 Eventually we can switch out the button ourselves but since the hole is still healing, our surgeon instructed us to bring her to the emergency department at Akron Children’s Hospital. He told us the hole could close within 30 minutes and that it would be painful for them to reopen it. So there certainly is urgency in getting something in the hole to keep it open. There are only three people who are supposed to be able to change the button, Dr Pittinger his partner, Dr. Andrews, or their surgical resident. Dustin took the catheter and put a small amount of lube on the ends and inserted it into her hole then using a syringe we filled the end, which is like a balloon, with a measured amount of water to hold it in place. Once we made sure the amount of water was correctly in, I taped gauze around it and attached it to Isabellas shirt to keep it from pulling out. Dustin ran downstairs to our office in the basement, (he works from home) and told his coworkers he would have to leave for the day. We are really lucky this happened near the end of the night so he didn’t have to miss a lot of work. We packed everything we needed to drive Akron Children’s Emergency Department which is an hour and a half away. I made sure we had formula, extra syringes, extra extensions, and all her medications. 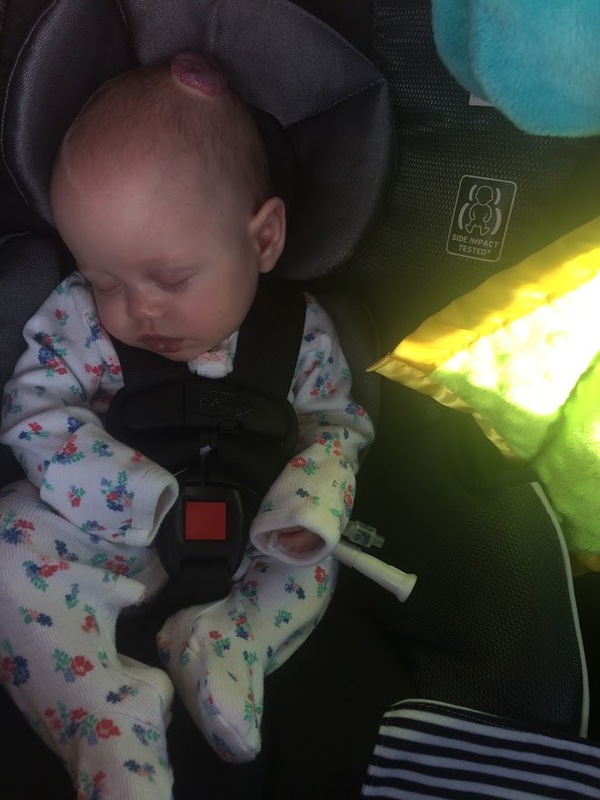 We placed her in her carseat and used a button down to pull the extension out and lay it gently beside her. The ride to Akron was pretty uneventful and she actually slept away. She was getting hungry because she didn’t get her feed. She doesn’t take anything by mouth so if her G-tube is out we can’t give her food or her medications. We called family and I also contacted a friend who is bringing us dinner. We told her to still bring it and Dustin’s parents would pick it up and put it in the house for us. They were already planning on being over because they have been mowing our lawn for us! On the way I called the Emergency Department and told them about Isabella and they contacted Dr Pittinger and his surgical resident. 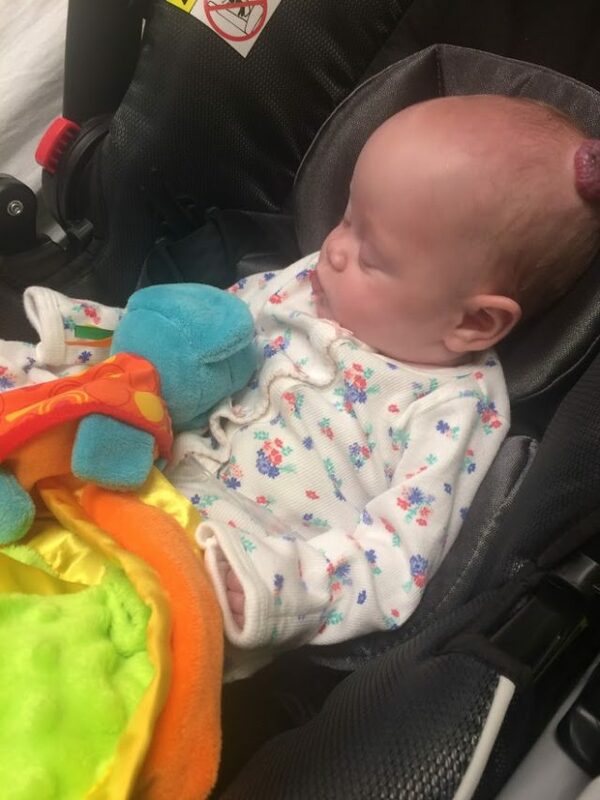 We explained Isabella was medically fragile and they said they would be ready for us when we arrived. 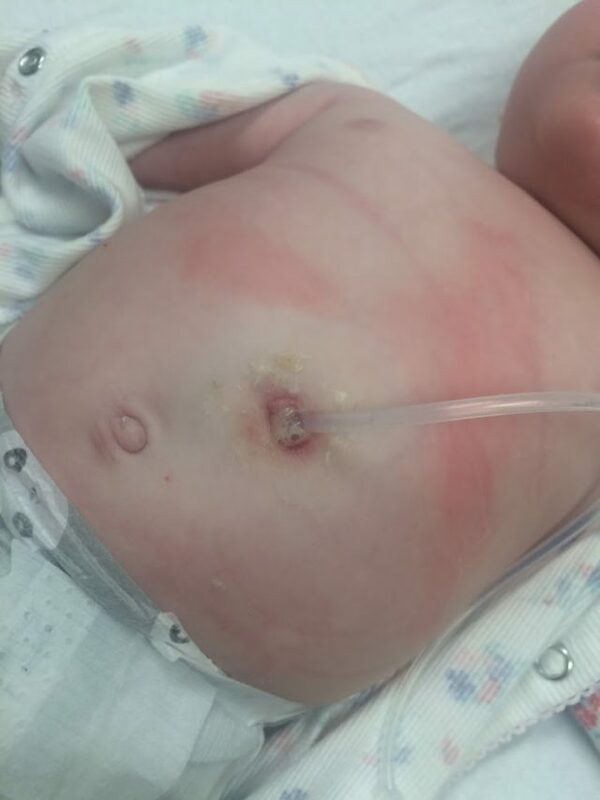 What Isabella’s button looks like outside of her stomach. The feeding button fell out because the balloon holding it inside of Bella’s tummy deflated. This can happen if the button is old, punctured, or if the water is evaporating. To be honest we’re not sure why Bella’s button deflated completely. We asked the surgeon and they don’t know either. This was frustrating, but we were happy to know she had a new button in. It’s strange going back to Akron Children’s Emergency Department because we lived in the same building for over 100 days. The NICU is on the sixth and seventh floor. When we staying in Isabellas room up there, I remember countless hours staring out at the city and listening to the ambulances go in and out from the Emergency Department. We knew the area like the back of her hand. We walked into the Emergency Department and as soon as we said her name we were ushered back quickly into a room where they did an intake on Bella. Then they took us to a private room and the surgeon walked in with in six minutes. They ordered as a new button change kit, even though we had our own (which saved time). It was nice that they moved so urgently. Isabella lays on the hospital bed, waiting with the catheter in for her button to be replaced. You can see the red marks where the tape was pulled off. Here she has her catheter in. All the while, Bella was getting pretty hungry. The resident walked in, sterilized, gloved up, asked a few questions and began assessing Bella. He asked if we wanted to put it back in, but we said no. I felt it was too far away from the official “heal” date of August 22nd. I also felt that if there was something wrong he would be able to tell. Within a few quick minutes he pulled the catheter out and inserted the new MiniOne button. Bella cried a bit when he accidentally tugged on the catheter, not realizing it was inflated inside her stomach (rolls eyes). It was a quick quick thing. The button is inserted and then filled with water to keep it in place inside her stomach. You have to measure the water correctly so that you know how much is inflated inside of her. For Bella, her balloon takes 2.5mls. After awhile you memorize it and know to check it to make sure it has the right amount. Isabella doesn’t seem to be in pain during the change and was just annoyed someone was bugging her and hungry. As soon as we go the new button in, the surgeon made sure it the placement was correct by pushing fluid in and taking it out of the tubing. Up close look at Bella’s stoma (medical term for hole). You can see the fluid and granulation tissue. We were able to stay in the private room to feed Bella. 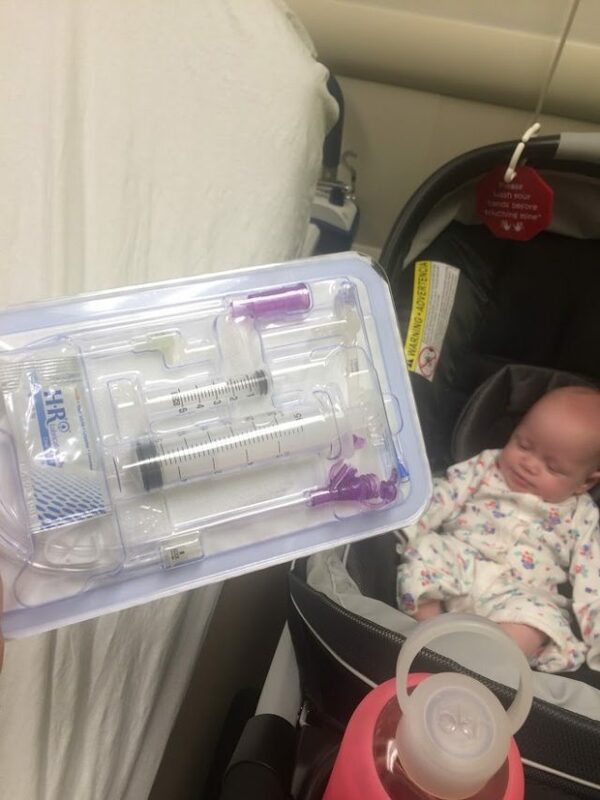 To feed her on the go, or in this case, an emergency, we put her speciality formula into a 60ml syringe and attach it to her extension cord. We then push the formula into her stomach slowly. She doesn’t tolerate this well and usually throws up. Unfortunately I didn’t have time to fully pack the pump. A quick fix! This is the surgeon inserting the new button. We were exhausted. We ran out of the house in a rush and were hitting the wall. We were so glad the ER visit took so little time and we were home before 9:00pm, but we were hungry. We walked in and saw a gift bag for us. Our friends Molly and Anthony Pingitore and their precious girls had prepared us dinner. We had a delicious chicken casserole, salad, cookie dough and green beans! While we prepared to feed Bella again we opened the sweetest card from them. Dustin and I both tried to hold back tears. It said lovely things and also had gifts for us. 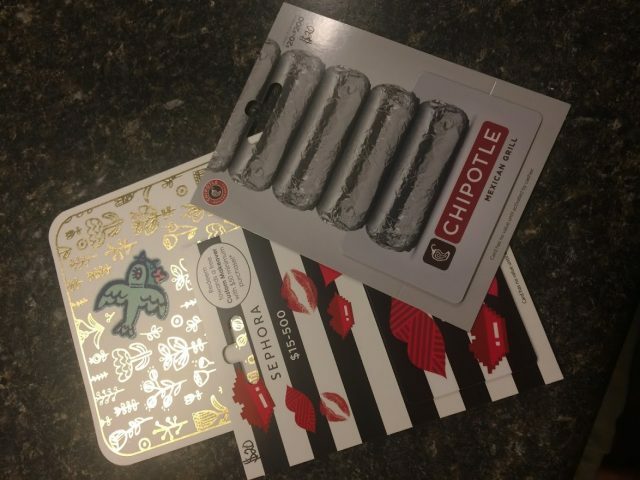 A gift card to Sephora for me and a gift card to Chipotle for Dustin. Bella sleeping after her button is changed. We fell into the couch after sanitizing and digged into a delicious meal. We both prayed out loud over Bella and our family. I know Molly and Anthony provided these things but I just felt the biggest hug from God himself. Not only did he provide the necessities (dinner), he provided chocolate chip cookie dough (we each grabbed some raw) AND a special gift for each of us. This was a very thoughtful gift since money’s rather tight and I don’t just go shopping for makeup. My foundation was running low and I wanted a new lipstick for my friends wedding. God used Molly to provide such a fun “extra” gift. That’s what I love about our Jesus. He cares about the little details that make us US. Thank you Molly and Anthony for allowing the Holy Spirit to work through you and for being so generous. The rest of the week we also received some amazing meals and gifts from others too! God’s awesome. Anyway, as soon as we took a sigh of relief, and things felt “in control” a week later to the day her button fell out again and we did the trip/process all over again. This time, though, we got some good information and (spoiler) approval to change the button out at home from now on! See Part 2! Easter and Spring is officially right around the corner! As the weather is warming up and my coffee order turns from hot to iced, my mind is on bright colors and outdoor fun. 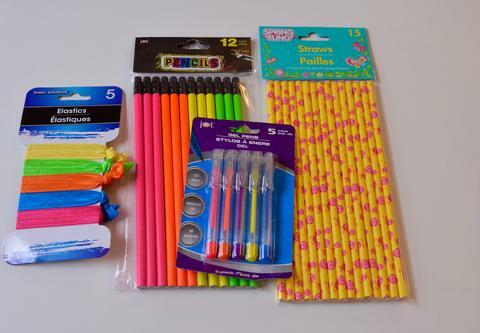 I don’t think you’re ever too old for gifts and bright colors. For this fun DIY, I decided to mix both. 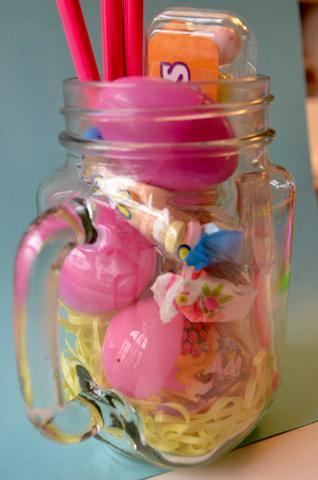 With some of my girlfriends in mind, I made these “Mason Jar Easter Friend Gifts.” Every single thing I purchased was found at the Dollar Tree and they only took a few minutes to put together. The best part in my opinion? The mason jars have glass handles so they’re more like summer mugs – perfect for iced drinks in the warmer weather. 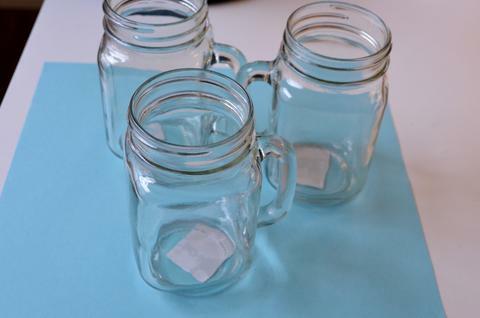 I began with some adorable mason jar mugs I bought. I didn’t bother to remove the sticker on the bottom. I’m not as OCD as some other DIYers. 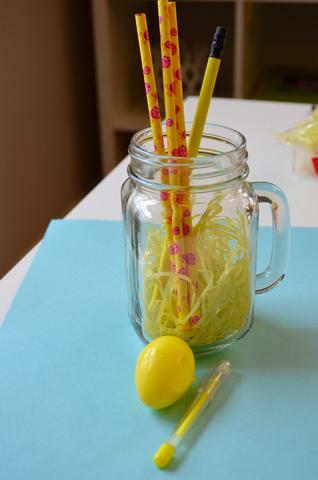 I figured the girls could always use writing utensils, the paper straws would be perfect for the mason jar glasses, and your hair always needs to be put back in the warmer weather so the elastic bands were the perfect touch. 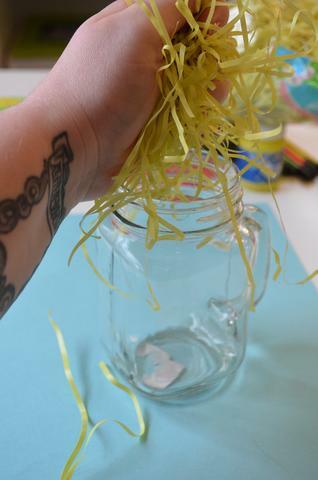 I also kept in mind the size of the jars and the size of the bright Easter eggs I purchased. 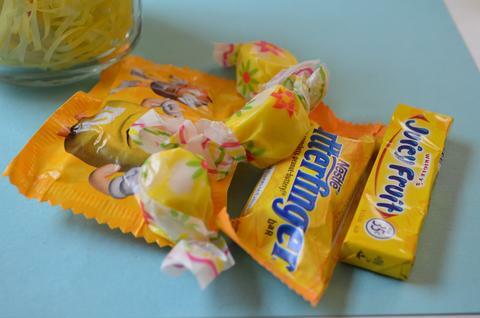 It was a little bit of a struggle to find yellow candy! 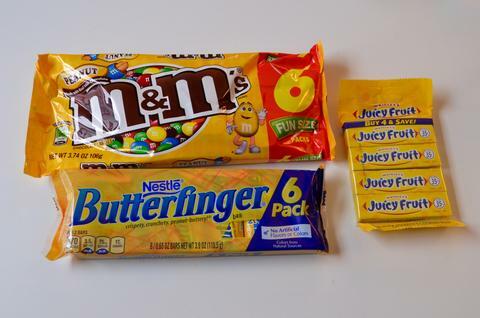 I picked M&Ms, Butterfingers, and Juicy Fruit. 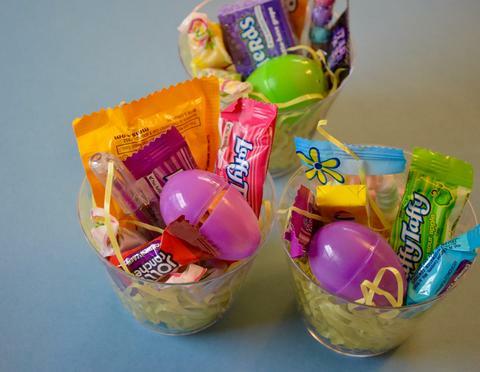 Other candy not pictured included Sixlets, Taffy, and candy necklaces. 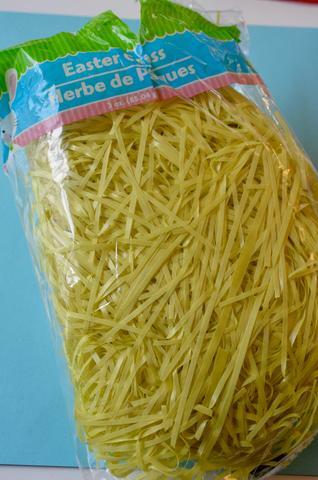 Of course you can’t have a gift that’s inspired by Spring/Easter without this fake grass stuff! I began by stuffing some in the bottom of the glasses. You may need to take a pencil or longer object to stuff it in. Once all the fake grass is in, it’s up to you and your creativity to fill the jar up with color coordinated/or not so coordinated items. 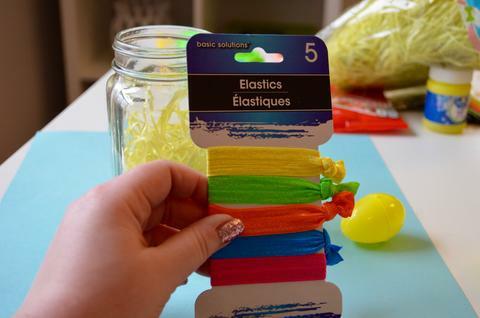 I thought a yellow elastic hair tie would work well in the smaller yellow Easter eggs. 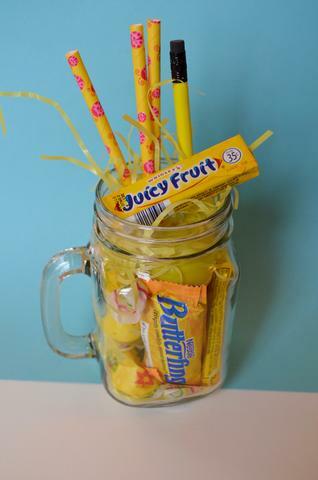 I also had a little yellow gel pen ready after placing some paper straws (aren’t they cool) and a neon yellow pencil in. 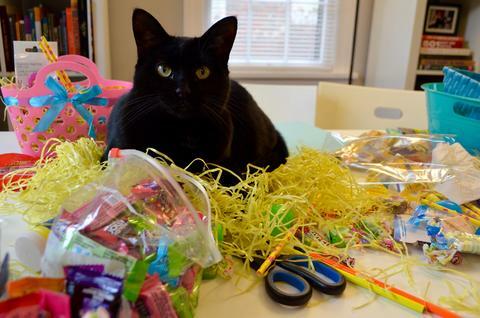 The candy was ready, too! 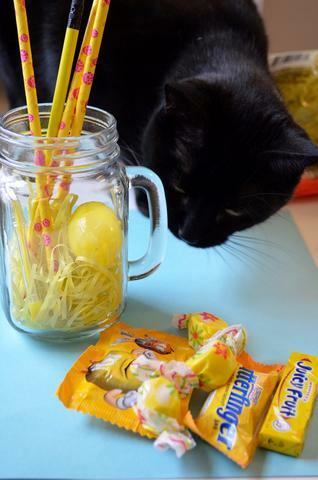 Silly kitty, this gift isn’t for you! 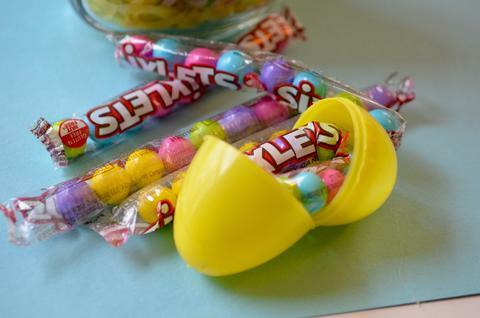 If an item doesn’t match the color scheme, like these Sixlets, I placed them in a yellow egg! 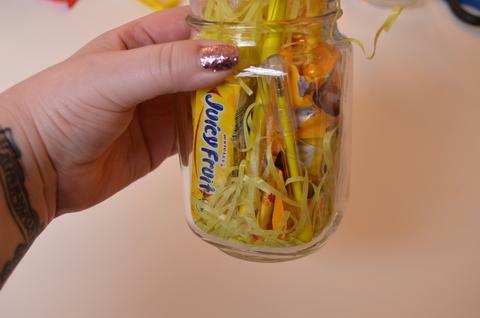 Once the jar is filled, it’s ready for giving! After I was done, I realized a little tag that says “For You” would be really nice. 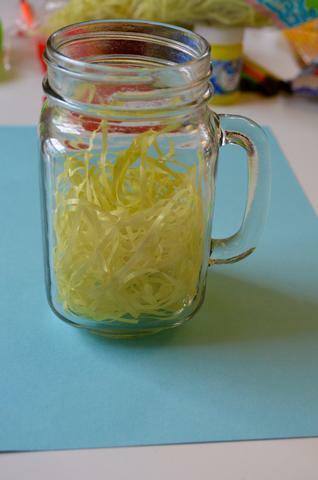 I added more fake yellow grass and made sure there was no empty space in the jar. What a cup of sunshine! I had planned to do three filled with yellow items, but I remembered my one friend loved pink. Since I had a lot of pink items…I went ahead and did a different color theme! Hot pink rules. 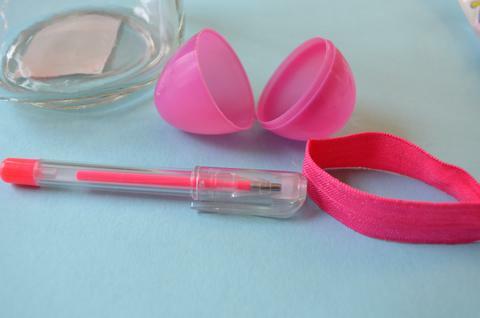 I placed the hair tie inside the pink egg. Don’t you love the mini gel pen? 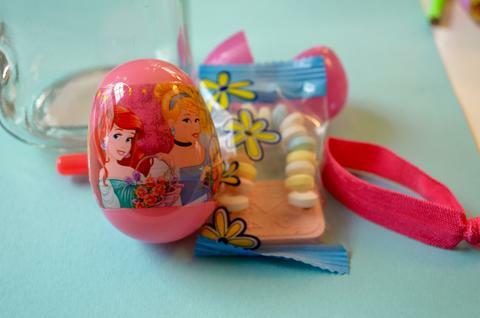 It doesn’t matter if you’re 10 or 30…Disney Princesses rock. So do candy bracelets. My bestie Jess will love this. I didn’t have pink grass, but you still get the idea of the color scheme. To make this gift more personalized you could write the recipient’s name in sharpie on the cup. Behind the scenes picture…the kitty loved bedding down on the fake grass. Since the mason jars didn’t have a ton of room, I had extra supplies. 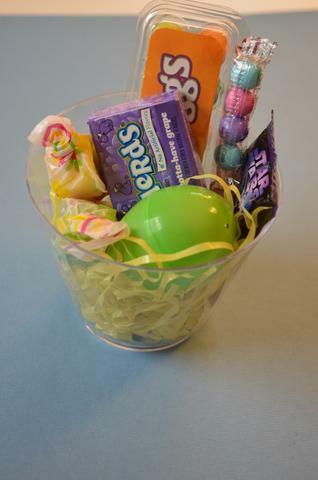 I thought outside of the “Easter basket box” and used little clear plastic punch cups for mini baskets. These will be given to a few of our family members.